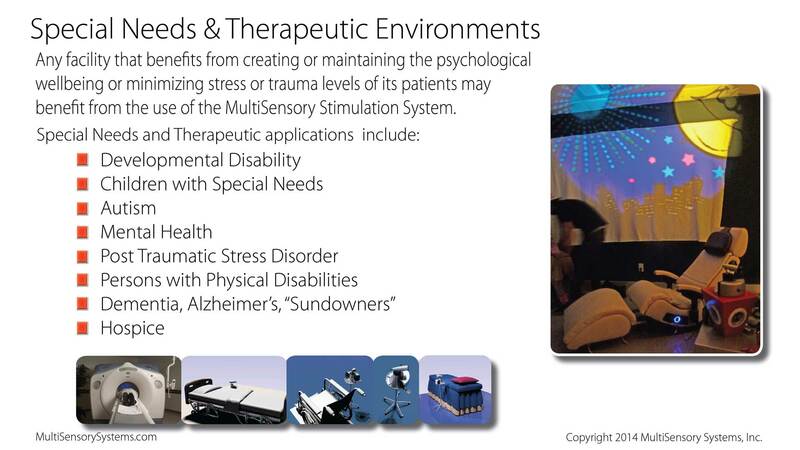 Any facility that benefits from creating or maintaining the psychological wellbeing or minimizing stress or trauma levels of its patients may benefit from the use of the Multisensory Stimulation System. MSS is ideal for integration into multisensory environments for Special Needs individuals and other therapeutic spaces, including hospitals, hospices, nursing homes, doctor’s and dentist’s waiting rooms, psychology offices, etc. After experiencing a prototype journey, Dr. Ken Druck noted that MSS can help people “process grief”. Doctors and nurses, psychotherapists, and hospital staff have expressed interest in adapting our systems for similar purposes, including soothing patients and stimulating the natural healing process in both pre- and post-treatment settings. Beth Comstock, Senior Vice President and Chief Marketing Officer for GE, experienced MSS at the Google Zeitgeist event and suggested that this type of system may have potential use within their medical imaging product line as a way to relax or comfort patients, specifically children, prior to intake. Multisensory research is an interdisciplinary scientific field concerned with the neural and psychological mechanisms of intersensory interaction. MultiSensory Systems © 2019. All Rights Reserved.